Beyoncé’s LEMONADE is filled with incredible artistry and stunning imagery. One of the most striking images for me on the visual album, though, occurs in the video for “Love Drought”. Much has been said about how LEMONADE draws influence from Julie Dash’s Daughters of the Dust, but less has been said in these same conversations about how the story of Igbo Landing is central to Daughters of the Dust and how the story of Igbo Landing- an act of mass resistance against slavery-also shows up in a really pronounced manner in the “Love Drought” Video. This scene and the video as a whole also occurs in a marshy, swampy landscape, matching African-American folklore descriptions of the location of Igbo Landing. 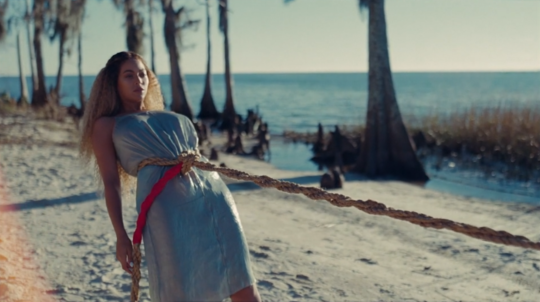 In addition, this is all mixed in with imagery of Beyoncé physically bound in ropes and resisting their pull, which directly evokes slavery, resistance and the events at Igbo Landing for me. 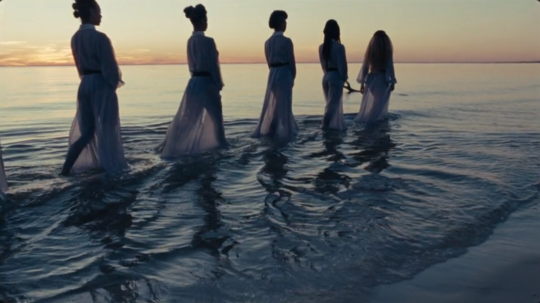 Lastly, I would like to note how Beyoncé and the group of black women she is with very deliberately rose their hands while in the water toward the sunset. 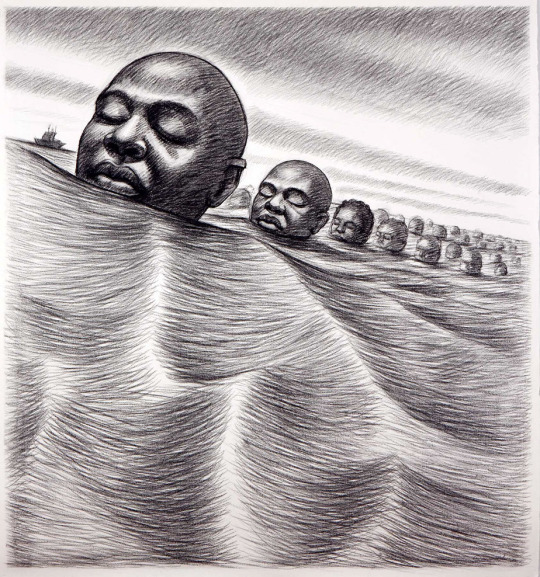 For me this recalled how the act of mass resistance at Igbo Landing was mythologized in many African-American communities as either the myth of the “water walking” or “flying” Africans. In the latter legend, the Igbo slaves walked into the water and then flew back to Africa, saving themselves in turn. Ain’t you heard about them? Well, at that time Mr. Blue he was the overseer and … Mr. Blue he go down one morning with a long whip for to whip them good… . Anyway, he whipped them good and they got together and stuck that hoe in the field and then … rose up in the sky and turned themselves into buzzards and flew right back to Africa… . Everybody knows about them. Seeing Beyoncé and a group of black women marching into the water and raising their hands collectively toward the sunset reminded me specifically of this last interpretation of the story of Igbo Landing where the slaves flew to their freedom. 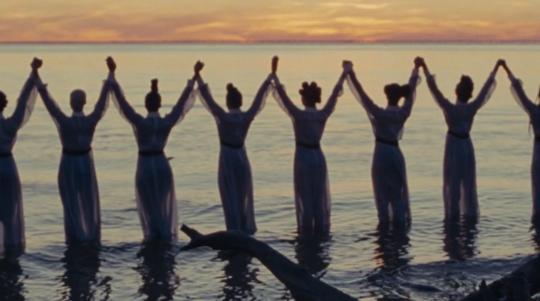 There are lots of potential interpretations for this video and the visual album as a whole but the core imagery of the “Love Drought” video – marshy landscape matching folklore descriptions of the location of “Igbo Landing,” images of Beyoncé bound in ropes and resisting their pull, a collective march into the water and holding their hands out toward the sky as if they were about to fly away together-basically screamed out to me as the story of Igbo Landing as I watched the video. It’s such a powerful act of mass resistance against slavery and as an Igbo person living today in America, it was moving to see imagery which reminded me strongly of it in LEMONADE as well. “Lemonade” is not simply another “he done me wrong” album or video. The relationship at the heart of the lyrics is a Trojan horse, opening to the shores of black womanhood as healing and salvation. It’s also obvious that Beyoncé and her collaborators have combed through some college syllabi and taken a few trips to the bookstore. 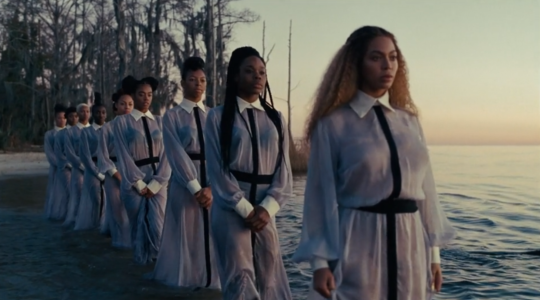 “Lemonade” is basically a video version of Black Feminist Lit 101. Click through to view the full list. Not everyone is feeling Beyoncé’s foray into country music with the song “Daddy Lessons” on her new visual album Lemonade, including Country Music Television News contributor Alison Bonaguro. Sure, Beyoncé’s new album Lemonade has a song with some yee-haws, a little harmonica and mentions of classic vinyl, rifles and whiskey. But all of the sudden, everyone’s acting like she’s moved to Nashville and announced that she’s country now. Some Twitter users saw a different problem: Bonaguro can’t hear the black roots of country music. Lemonade stands out both for Beyoncé’s emotional and musical range: She tells the story of heartbreak and self-affirmation through a Kübler-Ross model of griefsung in classic R&B ballads, trap, soul, rock, and also, notably, country music. This is a testament to Bey’s artistry. But it is also a reflection of the integral part black people have played in American music since its inception across all genres — including country music. In the visual album, Beyoncé kicks off “Daddy Lessons” singing “Yee-haw” while wearing a voluminous Antebellum-style dress cut from African wax print — paying tribute to her home state Texas and her identity as a person of African descent, which also parallels the origins of country music itself. Before Nashville was the home of the Country Music Hall of Fame and Museum, country music was a genre borne of African slaves. Indeed, musicologists have traced country music’s iconic banjo back to the ngoni and xalam, plucked stringed instruments rooted in West Africa. And yet country music’s “little white myth” persists today because of the erasure of the genre’s black roots and the contributions black artists have made to it over the years. One of the first black icons of country music was DeFord Bailey, an outstanding harmonica player whose hillbilly records in the 1920s drew from the black folk music tradition he grew up with. In 1962, Ray Charles, one of the fathers of soul music, released Modern Sounds in Country and Western Music, the first country record to sell 1 million copies, ushering in the possibility of the sort of pop and country music crossover for which white artists like Carrie Underwood and Taylor Swift are now celebrated. “[‘Daddy Lessons’] doesn’t sound like a country song to me,” Bonaguro wrote. That has little to do with Beyoncé and almost everything to do with the way country music’s black voices have been silenced or forgotten. Some of these analysis’ are fascinating. I’d seen Daughters of the Dust, the movie that some of the video is based on, but I didn’t know about its Igbo origins. But there’s a lot of history so many of us just don’t know about. Even if you don’t think much of the album itself, you must admit the video imagery is opening up some interesting avenues of discussion among PoC. It’s okay if you’re white and don’t get it, as Lemonade wasn’t written with white people in mind, but this could be a learning experience for you, as you share in finding out some fascinating details of Af-Am history. No, this isn’t going to be a regular weekly them or anything. I’ve always been a middling Beyonce fan. I’ve been following her career since her Destinys Child days, latching on to the odd single here and there, liking her more serious songs, (although most of her more famous songs are not the deep ones.) I think this is one of her more mature albums, not just deeply personal to her, but resonant with so many other women. If you’ve ever been in a situation where you’ve been betrayed by someone you loved and trusted, the songs will definitely strike a chord with you. That’s not something you need to be Black to experience, but there are elements of the songs,and especially its video presentation, that speak most directly to African American women. Another thing I find interesting is the virulently racist reaction to what is a essentially a bunch of songs about cheating. At their most basic level, the songs are just one woman’s deeply personal reaction to something that may, or may not, have actually happened to her, but the reaction to this is entirely out of proportion, when you understand that all she’s really done is make a few thousand black women feel loved and understood. I guess some people consider self-love a dangerous thing. Fascinating! The BLM themes in ‘Formation’ are of course quite explicit (and I love that song), but i want to check out the rest of the album properly now. And bless Bey for being unabashedly sincere and showing her work with pride. Apparently Beyoncé really is a worshipper of the Orishas, which I’m told is an offshoot of one of the Nigerian religions. So everything she does, the colors, iconography,and props all have deep religious meaning. Love the analysis of Igbo Landing and the origin of country music. This album is so deep and rich. I hope it gets at least one of Emmys it’s nominated for and cleans up at the Grammies. I love it when artists put history and the lessons for us today in a meaningful way. I hope that is what Beyonce is going for. It is sort of like Cold Play and the Vida la Vida song. We can learn a lot from history so we won’t repeat the mistakes. but build on the good lessons they passed down to us.